Diners at a Pittsburgh restaurant will no longer be expected to leave a tip at the end of their meal. Instead, the employees will soon start receiving a salary, health-care benefits and shares. 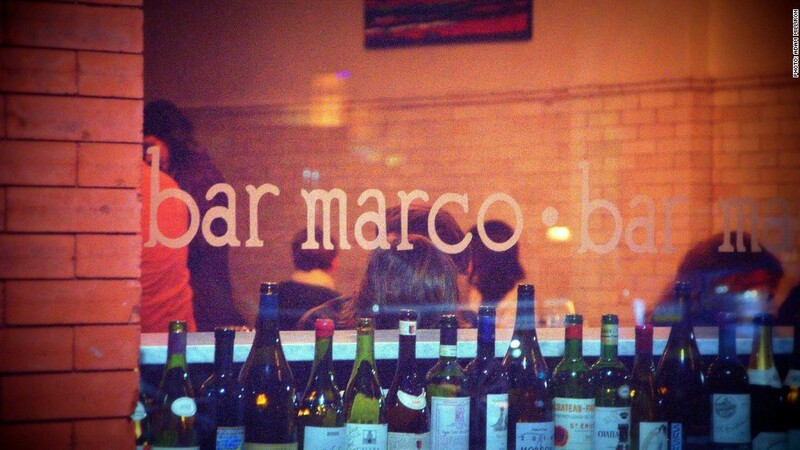 Bar Marco's 20 employees will work 40-44 hours a week, receive a base salary of $35,000 a year along with health care benefits and 500 shares in the business. The new compensation plan and the no-tipping policy will go into effect by April. "We knew if we wanted to keep our momentum going, we have to continue to take care of the team who has gotten us to this point," said Co-founder Bobby Fry, who announced the new plan in a tweet on January 2. 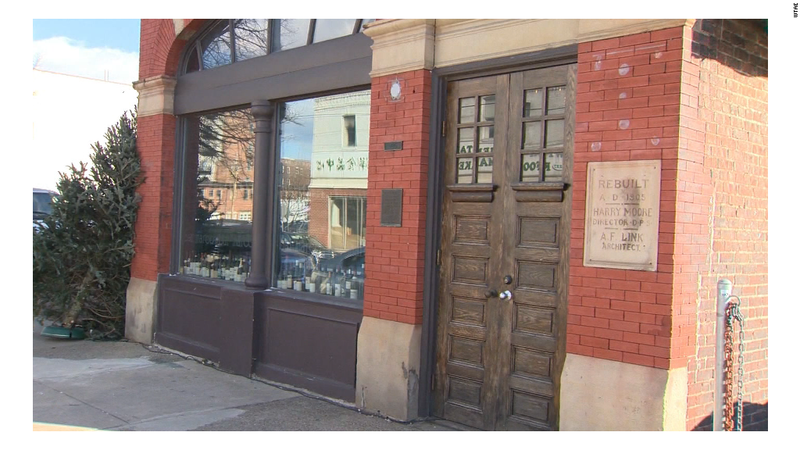 Workers will be required to attend a bi-monthly meeting to review the restaurant's performance and budget. The shares, which vest after three months, are worth $1 and increase in value over a worker's tenure. Fry admitted it took him awhile to figure out the best compensation plan for his workers, but he didn't want to add a blanket 20% service charge or raise all the menu prices. "That is forced tipping anyway, and I don't want to limit the upside to what servers can get." Could this mean the end of tipping? Fry explained that had to rework his restaurant budget, with a greater share going toward employee costs. And some menu prices will go up. He gave an example of the $5 patatas bravas dish currently on the menu, which will likely increase to $9. "But it will have something like house made chorizo and fermented greens; we will have a much more complex menu." The restaurant is also taking on cost-cutting measures like breaking down whole animals in house, making their own meats and sausages, and pickling and fermenting vegetables on site. It's also expanding its tasting menu offered in its Wine Room to 30 customers from 20. Previously, patrons chose from two seating times, but now they can sit any time. The restaurant, which is located in an old fire house, experienced 40% revenue growth last year and Fry expects the momentum to continue -- particularly from planned events, which provide a glimpse of future sales. 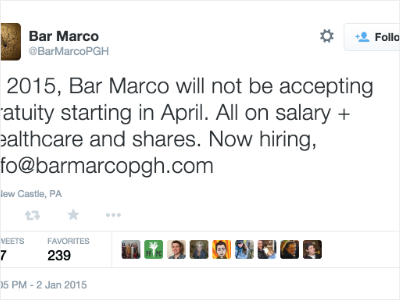 Fry, who runs the restaurant along with two high school friends, sent out the tweet from Bar Marco's account, along with an email address for people seeking employment with the three-year old restaurant. He said he tweeted it from a coffee shop without really thinking of the implications, and has been surprised by the huge interest. "That is one of my least exciting tweets, I just kind a mentioned it, I didn't even have a press release ready." He said it's been re-tweeted nearly 250 times and the company has received 120 applications and counting for the single open position. The owners plan to implement the new compensation strategy at their second restaurant location next year.